A McDonald's All-American, Kyle Wiltjer began his college career as a sparsely-used role player on Kentucky's 2012 National Championship team. Moving up the depth chart (but still failing to crack the starting lineup) as a sophomore, Wiltjer played well  though unremarkably  in his second year in Lexington. Following the sophomore season, he made the calculated decision to transfer to Gonzaga, where he felt taking a redshirt season would grant him some necessary time to improve his body  which would, in turn, improve his draft stock. Three years have passed since Wiltjer first arrived in Spokane and in that time he's developed into one of the NCAA's very best offensive players. He led Gonzaga to a 35-3 record as a junior and an Elite 8 NCAA Tournament appearance, and then followed that up by making the Sweet 16 as a senior. Throughout his time in college, Wiltjer's dynamic scoring skillset stayed consistent  though his weaknesses on the defensive end persisted as well. At 6'10 and 240-pounds, Wiltjer has good size for a power forward and has worked hard to increase his bulk, even if his body still leaves a lot to be desired. On top of that, he's a below average athlete, struggling to bend his knees and having very little quickness and explosiveness, which hampers him particularly on the defensive end. His movements are somewhat mechanical, but he knows his limitations and rarely tries to do too much on the court, which increases his value and efficiency. Wiltjer's a smart player with a tremendous offensive skillset and a good team-first mentality. His usage hit a career-high 28.2% as a senior the fourth highest rate for a big man among DX top-100 prospects. Still, his scoring and efficiency remained impressive, averaging 24.9 points per 40 minutes pace adjusted fourth-best among DX top-100 prospects, with an excellent 63% true shooting percentage (16th). While his shooting percentages dipped a bit from his incredibly strong rate as a junior, he remained as one of the best shooters at the college level. For the year, Wiltjer made 53.8% of his shots from within the arc and 43.5% on shots from the perimeter. Two ominous signs from Wiltjer's senior year were his dramatic dip in assists and his increase in turnovers. As a junior, Wiltjer racked up 2.7 assists per 40 pace adjusted. That rate was cut by two-thirds to just 0.9 assists per 40 minutes pace adjusted as a senior. To make matters worse, Wiltjer's turnover rate increased from 7.9% as a junior to 11.1% as a senior. In fairness, that's still a low turnover rate. It is safe to say that Wiltjer is not much of a passer, though he does move off of the ball diligently enough to create additional spacing for his teammates to operate, especially considering how much of a threat he is to make shots with deep range. Wiltjer's biggest asset as a prospect comes with his accuracy from deep. He has a high and quick release with legitimate NBA range, making him extremely difficult to guard at his size. Wiltjer hit on 89-of-203 (43.8%) perimeter shots in his senior year, along with an impressive 51-for-118 (43.2%) rate on contested catch-and-shoot opportunities. Moreover, Wiltjer has expanded his shooting ability beyond mere set shots. In his senior year, Wiltjer converted on 33-of-74 (44.6%) jump shots taken off of the dribble in the half court  an impressive rate for a player with a slow first step and average ball-handling ability. While he struggled as an underclassman against perimeter defenders who mitigated his shooting skills above the arc, Wiltjer added a respectable interior post game to his arsenal, forcing teams to reconsider who they'd use to guard him. Per Synergy Sports Technology, Wiltjer converted on 68-of-144 (47.2%) of his post-up attempts and scored on 40-of-65 (61.5%) of his shots around the basket in non post-up attempts as a senior. He's not one to necessarily seek out contact, but he has a soft touch, sound footwork, and an array of moves around the basket that allow him to get off clean looks that look effortless, even against some of the nation's top rim protectors. Defensively, Wiltjer's physical profile raises all sorts of red flags. His lateral quickness is nonexistent, and while he's worked diligently to improve his core strength and balance, it's still a noticeable liability in his game, as he often looks like he's playing on stilts. He rarely contains penetration and doesn't show much ability to navigate around a screen, consistently setting up unfavorable mismatches. He's improved his defensive stance since his Kentucky days, but it still looks awkward and doesn't do much to aid his balance or lateral quickness. He tries to compensate with his lack of agility by cheating on defense through anticipating where drivers will attack, yet he can be shaken off balance fairly easily with a simple crossover combination. Although he's come a long way as an interior presence since his Kentucky days by increasing his intensity level and competitiveness, it will still likely be tough to find a position for him to guard. Wiltjer's struggles on the defensive end translate as a rebounder. His rebounding actually regressed in his senior season from 8.7 rebounds per 40 minutes pace adjusted to just 7.4 per 40 minutes pace adjusted. His 10.3% rebound rate placed below guards such as Gary Payton II and Malik Beasley in our database, despite playing a big man position in a less competitive conference. Again, Wiltjer's body type just doesn't allow him to compete with NBA-level athletes. His lack of lateral quickness and his struggles on the glass will only be exposed further as his competition level improves. Kyle Wiltjer entered college basketball as a McDonald's All-American and played a contributing role as a freshman during Kentucky's 2012 National Championship run. After a subpar sophomore season, however, Wiltjer decided to transfer to Gonzaga and he spent his redshirt season attempting to transform his body and skill set. He hit the ground running as a junior, breaking out amidst Gonzaga's 35-3 season and anchoring the nation's sixth most efficient offense in the process. Wiltjer led Gonzaga to a two-seed in the NCAA and a run to the Elite 8, but expectations are even higher on the eve of his senior season. A pre-season All-American Candidate, Wiltjer has the opportunity to take another step forward and prove to scouts that he has what it takes to excel at the next level. Despite Wiltjer's work in the weight room, his physical profile remains mixed. On the one hand, he has optimal size for the power forward position at 6'10 with a 240-pound frame and decent mobility. On the other, he is a below average athlete, neither particularly quick nor fluid in his movements. He does not have the length or strength to compensate, but he does play within his limitations in a way that does allow him to maximize his physical strengths. Much of this has to do with his versatile offensive skill set and his outstanding instincts and efficiency. Wiltjer saw nearly two times as many possessions as a junior than he did as a sophomore and he responded by averaging 24 points per 40 minutes pace adjusted, best among collegiate prospects in our top-100. Wiltjer significantly improved his shooting efficiency, as well, making 56.8% of his shots inside of the arc and 46.5% of his shots from beyond. Despite his offensive prowess, he also proved to be a willing distributor, averaging 2.7 assists per 40 minutes pace adjusted against 1.6 turnovers. Wiltjer is at his best as a shooter, where he showed the ability to make shots in a variety of capacities. Whether trailing in transition, stepping out in pick-and-pop sets, or spotting up on the perimeter in half-court sets, he is simply a lights out shooter with his feet set, making a remarkable 59.2% of his guarded attempts and 43.2% of his open looks. He boasts a quick release, a high release point, and NBA range, which allows him to get his shot off when he pleases, and makes him very difficult to guard at his size. While Wiltjer excels as a shooter, his post game presents a mixed bag with an eye towards the next level. He had trouble holding his own against more athletic defenders, often getting pushed off of the block and struggling to finish through contact. His 4.2 free throw attempts per 40 minutes pace adjusted reflected his perimeter tendencies, as well as his limitations as a finisher. While he lacked standout strength, length, and explosiveness, Wiltjer did make 51.8% of his post-up looks, while showing a solid arsenal of spin moves and jump hooks. He compensates for his subpar athleticism somewhat with a combination of solid footwork, a soft shooting touch, and savvy operating around the basket, more often than not playing within his limitations. He is also a very good scorer operating off the ball. He made an impressive 67.5% of his non-post-up looks around the basket and demonstrates top notch timing and shooting touch. He was also an outstanding scorer out of the pick-and-roll, demonstrating excellent fundamentals in both pop (72.7% FG) and roll (81.3% FG) capacities. He is a far less effective scorer off of the dribble, however, making just 29.6% of his shots in this capacity. His average first step, handles and athleticism really limit his pull-up potential, even if does show some promise with his runner in the lane. NBA teams are unlikely to ask Wiltjer to create his own shot very frequently, which is why his ability to score operating off the ball at the frequency and efficiency he does is so intriguing. On defense, Wiltjer's subpar lateral quickness limits his effectiveness inside and outside, as a man defender and in pick-and-roll situations. He also struggled to guard stronger offensive players, though he also did not appear to display the most consistent effort on the defensive end of the floor either. It is no surprise, therefore, that he is also an average rebounder, grabbing 6.8 defensive rebounds per 40 minutes pace adjusted and 8.7 total. Wiltjer's body type is a significant concern here, as he struggles to get into a low stance on the perimeter, and is very susceptible to getting beat off the dribble in turn. There are real question marks about whether he will emerge as a liability on this end of the floor, a player that opposing coaching staffs will target and try to put in open space repeatedly to see if he can hold his own. Though Kyle Wiltjer's defense call his NBA viability into question, his transformation into one of the nation's best and most versatile scorers is intriguing in today's NBA. Whether Wiltjer's physical gains are impressive as reported remains to be seen, but his stock should only improve if he can continue to develop as a senior. His physical profile likely limits his ceiling, but his offensive versatility, particularly in areas that front offices covet, nevertheless makes him a legitimate NBA prospect. In the meantime, expectations are very high in Spokane and Wiltjer should have plenty of opportunities to audition in front of NBA decision makers. 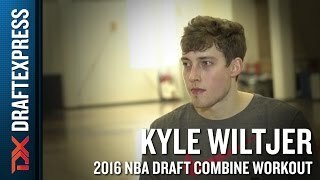 Kyle Wiltjer torched the Nike Academy nets in a variety of ways and was without a doubt the best scoring big man in the group. Wiltjer drilled catch and shoot after catch and shoot three, and also showed the ability to attack an occasional closeout into a step back jumper or floater in the lane. The Gonzaga sniper was the best shooter at the camp and he consistently made opposing bigs pay for giving him any time or space to get off his jumper. Wiltjer didn't just operate as a spot-up shooter, however. He's very skilled from mid-post spots, as a he displays solid footwork, a few nifty up fakes, turnaround jumpers, and very good touch on his right handed jump hook. Wiltjer was also very effective in short roll situations as he did a nice job either stopping and popping in mid-range spots, making the right read or using up fakes to get defenders in the air. He's not a big-time athlete or overly long or strong, but the Canadian sharpshooter has a chance to be the best offensive player in the NCAA next year as a senior. Defensively, however, Wiltjer is still a bit of a liability. While he did appear to add some weight to his frame, Wiltjer doesn't play with great toughness on the defensive end, as he struggles defending the post versus stronger bigs. He's not very involved on the defensive glass either, making him a focal point for opposing bigs to attack on the interior. Wiltjer could probably slide by somewhat on the defensive end if he was able to contain the ball in the pick and roll and stay in front of face-up power forwards in the half court, but his lateral quickness leaves much to be desired. He's actually fairly mobile on the offensive end, but his fairly wide hips and struggles consistently getting down into a stance and sliding really hurt him as a perimeter defender. Wiltjer will most likely never be a prolific defender given his physical profile, but his stellar offensive package could make him a strong second round pick option next year when he becomes automatically eligible for the draft. One of the highest ranked players in the 2011 recruiting class, Kyle Wiltjer had a modest freshman season, but that's not at all surprising given the immensely talented team he played for. Headed into this season, Wiltjer should have opportunities to significantly increase his role, but he'll still have plenty of competition from Kentucky's perennial top recruiting class. Standing 6'9 with a decent frame, a still developing body, and solid length, Wiltjer is just an average athlete for his size, running the floor awkwardly, but relatively well, and being coordinated in his movements, even if he's lacking in exceptional quickness or explosiveness. On the offensive end, Wiltjer was best known for his strong outside shooting ability heading into his freshman year, and he lived up to that reputation on the floor, shooting a very good 43.2% from three-point range, and taking nearly half of his 4.1 field-goal attempts per game from behind the arc. Wiltjer has excellent form, sporting a high and quick release that benefits from his very good height and length, making him a dangerous threat for spot-up jumpers and especially on pick-and-pops. His strength in this area is ideally suited for the style of play many NBA teams use, and it will be interesting to see how significant a staple of his game this remains as he expands his playing time and role in Lexington. Beyond his outside shooting, Wiltjer performed decently in a number of other areas, but didn't really stand out at one in particular. He rarely operated with the ball from isolation situations, though he did look solid with simple, straight-line dribble-drives on spot-up attempts when he had the opportunity. Wiltjer's face-up game was a selling point of his heading into college, but the jury's still out on whether he can continue to excel with that against the physically gifted opponents he faces in the SEC and beyond. Wiltjer's post-up game was also largely a non-factor his freshman year, though he did look competent on simple hook shots and turnaround jumpers when he had the opportunity. His ability to finish around the basket in general wasn't particularly impressive, as he is a decidedly below-the-rim player, but he still does a decent job and has room for improvement given his skill level and feel for the game. He has developed a nice, uncharacteristic floater in the lane for a player his size, which is also something to watch for going forward. Wiltjer wasn't able to contribute much beyond the scoring game his freshman year, showing some flashes in the passing game but being mostly a non-factor otherwise. His rebounding ability is most concerning, as he averaged an awful 6.0 rebounds per 40 minutes pace adjusted while playing exclusively at the power forward and occasionally center positions throughout the year. While his upside with offensive rebounding is somewhat limited given where he plays on the floor, putting a more concerted effort to improving on the defensive end will be very important for him, as it's difficult to find a single power forward in the last 10 years who was drafted with such poor rebounding numbers. Defensively, Wiltjer shows a good effort level and fundamental base in the post, using his size and length well to contest shots. He is prone to being backed down by stronger opposition, but for the most part holds his own and still has the room to add more weight to his frame and bolster his strength on the block. His perimeter defense is more concerning for a power forward, as he doesn't possess good lateral quickness and can be severely outmatched by face-up oriented power forwards with his extremely high center of gravity and upward stance. He doesn't really have an ideal position on this end of the floor from an NBA perspective, but will still need to maximize his abilities to become as good of an individual defender as he can. Looking forward, Wiltjer strongly excels with one skill in particular, his outside shooting, and that combined with his size gives him a strong foundation to build upon as a prospect. There's good reason to believe based on his pre-college performance that he still has much more to show on the offensive end, and should have opportunities to do so this season. How he expands his game offensively and how he can improve defensively will both play key roles in determining his prospects as a player.